Let it be known that Kryptonian Warrior is, and always has been since the 1991 Joe Johnstone directed live-action movie, a massive fan of 'The Rocketeer'. Many people put that movie in the same rock-bottom league as The Phantom and The Spirit (which are actually another two films I really liked when I was younger) but I absolutely loved it. 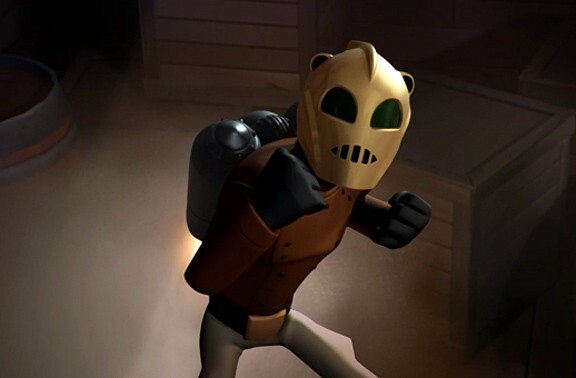 The Rocketeer recently celebrated its 20th anniversary (which technically isn't actually until August 2nd in the UK) and Paris-based 'Digital Banana Studios' created an original animated short film starring the Rocketeer that honours the work of creator Dave Stevens and filmmaker Joe Johnston, who directed the live-action film.